Brahimi: Knew this would be difficult and complicated process. Certainty is a very rare commodity. 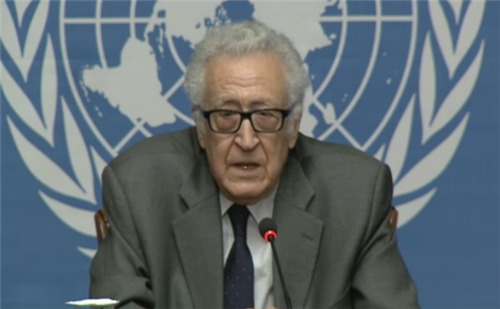 Syria envoy Lakhdar Brahimi said he met separately with both Syrian delegations yesterday and today. 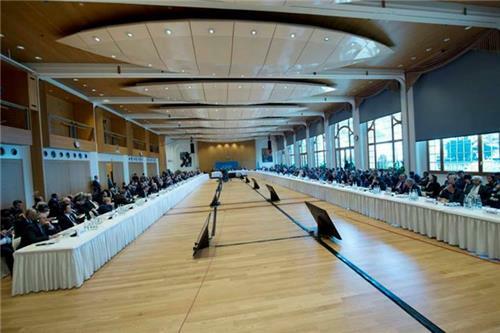 However, tomorrow the delegations will meet in the same room. 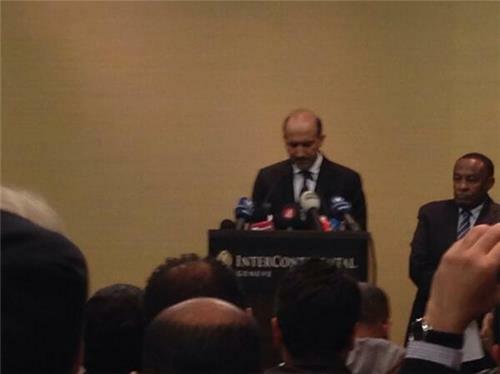 Jarba implying he will not be in the negotiating room personally. Wonder if that is govt demand. They hold him in particular contempt. Last night deputy FM of Syria Fayssal Mekdad said that after terrorism, humanitarian crisis, etc are finished, then can talk transition. Syria's President Bashar al-Assad is not ready to step down yet, U.S. Secretary of State John Kerry said on Thursday, a day after Syria's government and opposition met to launch peace talks during an international conference in Switzerland. "Obviously he is not ready at this point in time," Kerry said in an interview with Al-Arabiya on the sidelines of the World Economic Forum meeting in Davos. 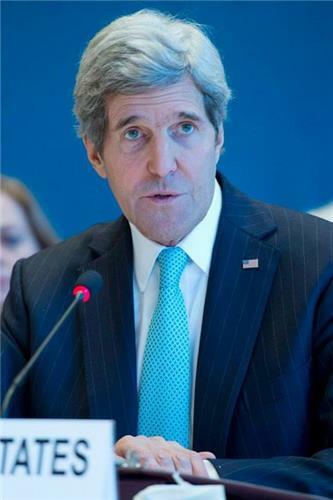 Kerry said if a peace agreement is reached, many countries had offered to send peacekeepers to Syria. "If there is a peace agreement, there are many countries that have already offered to step up and be peacekeepers in the new Syria," Kerry said. "There is no question but that we are all prepared to help provide protection to any of the minorities." 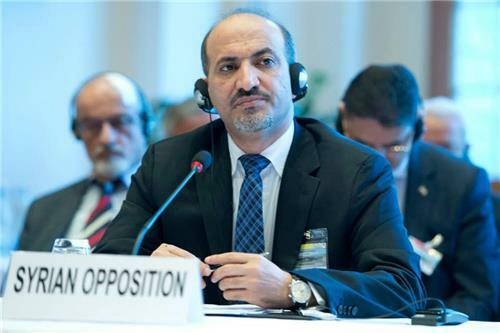 Ahmad Jarba: the deads of the Syrian regime are engraved on the bodies on 11,000 detainees tortured to death, and they speak of terrorism! In an interview with Al Arabiya, Secretary of State John Kerry said Assad is 'not ready at this point in time' to step down, Reuters reported Thursday afternoon. Kerry said also said if a Syrian peace agreement is reached, 'many countries' have offered to send peacekeepers to Syria, including to protect minorities, according to Reuters. Al Jazeera confirms opposition fighters withdrawal from Manbij in Aleppo. Now controlled by Islamic State in Iraq and Levant. It's the regional heavyweight that few want at the table, but without it any attempt to end the Syria war may be futile. Iran's backing is crucial for President Bashar Assad's hold on power — and for the Iranians, Syria is key to their aspirations of regional power. As an international conference on Syria kicked off Wednesday with the participation of more than 40 countries, Iran's absence hung over the meeting, following a diplomatic debacle that saw the U.N. withdraw a last-minute invitation after an uproar from the United States and the Syrian opposition. The absence of Damascus' strongest regional ally stood out even more given that the biggest supporters of the opposition were all present: Saudi Arabia, Qatar and Turkey. The question of Iran's participation underlines how the international powers that have lined up behind either Assad or the rebels trying to topple him are as crucial to a solution as Syria's warring parties themselves. Like any of the regional players, Iran can be a spoiler for a resolution it opposes or can be a force for pressuring its side to make concessions. "The decision to exclude Iran from the Montreux talks is a huge diplomatic mistake," said David Cortright, director of policy studies at the Kroc Institute for International Peace Studies. "As a major backer of the current regime, Iran has enormous potential leverage in Damascus," he said. 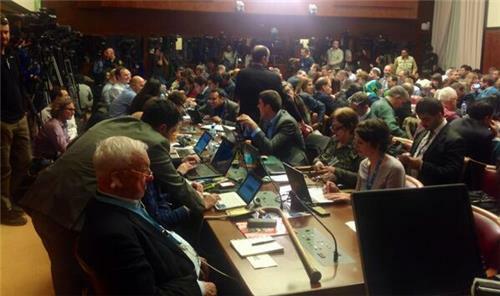 As top diplomats from the United States, the United Nations, Russia and elsewhere meet in Geneva along with representatives from the Syrian government and elements of the opposition, their most immediate aim is to keep everyone at the table and talking. The attendees are attempting to extract an agreement from all sides to establish a transitional government — supported with more than $1.7 billion in humanitarian aid from the United States — but one topic that won’t be on the agenda is the possible partition of the Syrian state. While the Defense and State departments both strongly dismiss any suggestion that dividing Syria along ethnic lines might be on the table during the Geneva talks, for many observers, fragmentation, separation or enclave creation has already occurred. Iranian President Hassan Rouhani spoke Thursday at the World Economic Forum in Davos. And while most of his speech appeared to focus on Iran's nuclear program and the interim nuclear program reached with the international community, he did touch on the Syrian crisis, according to Reuters. However, he poured cold water on a U.N.-sponsored peace conference on the civil war inSyria, which opened in Montreux, Switzerland on Wednesday in the absence of Iran, a key ally of Damascus, which was excluded after refusing to endorse the goal of a transition from President Bashar al-Assad's rule. 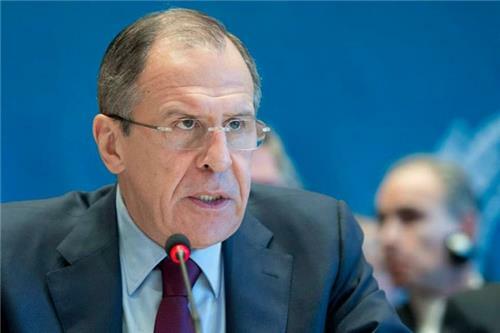 "Reaching a conclusion will be very difficult but my wish is that if all efforts go in the direction of the wishes of the Syrian people, that is the direction that should prevail." "As to whether this conference can achieve its objectives, I have a lot of doubt," he added. Rouhani accused Saudi Arabia and Qatar of backing "terrorists" in Syria in an effort to extend their own influence in the Middle East. Syria's government and opposition, meeting for the first time, vented their mutual hostility on Wednesday but a U.N. mediator said the warring sides may be ready to discuss prisoner swaps, local ceasefires and humanitarian aid. Russia said the rival sides had promised to start direct talks despite fears that a standoff over President Bashar al-Assad's fate at the meeting in Switzerland would halt the push for a political solution to Syria's civil war, which has killed over 130,000 and made millions homeless. Even if the sides are willing to talk about limited confidence-building measures, expectations for the peace process remain low, with an overall solution to the three-year war still far off. Western officials were taken aback by the combative tone of Syrian Foreign Minister Walid al-Moualem at the one-day a U.N. peace conference in Montreux, fearing follow-up negotiations would never get off the ground due to the acrimony. However, international mediator Lakhdar Brahimi signaled that both sides were ready to move beyond rhetoric. "We have had some fairly clear indications that the parties are willing to discuss issues of access to needy people, the liberation of prisoners and local ceasefires," he told a news conference. 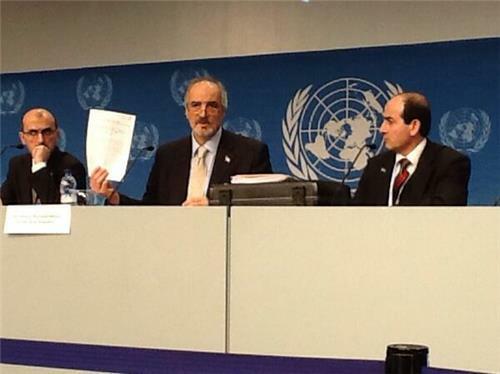 A journalist asks Jaafari to stop giving "terrorist activities examples" And he stops. 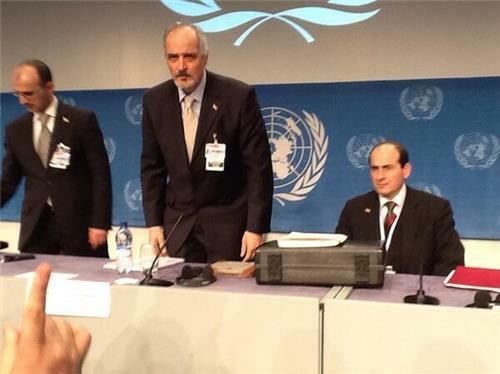 Syria's envoy to the UN Jaafari says Syria needs encouragement to engage 'in sincere and honest" implementation of Geneva 1 agreement. He added that a political settlement "cannot go hand in hand with terrorism", a common refrain from the regime during the course of Wednesday's peace talks. Secretary of State Kerry has concluded his press conference. Last qu flatly asks: Is the (US) military option still on the table? "The president never takes any option off the table." Kerry: Hopes iran will eventually be involved in talks. When asked about the alternative to Geneva 2, Kerry said he wouldn't speculate past the conference, especially since Wednesday is only the first day. He added that talks to end wars, especially such complicated wars, take time. 'This is already one of the worst catastrophes' of humanitarian crises, he added. Q from Orient TV, an oppo channel: Fear that "this regime" is just buying time. what is alternative to Geneva? Kerry: this is first day! Kerry trying to isolate Syria: "clearly understand how alone Assad is, standing up for himself and his family. It can't be about one man."